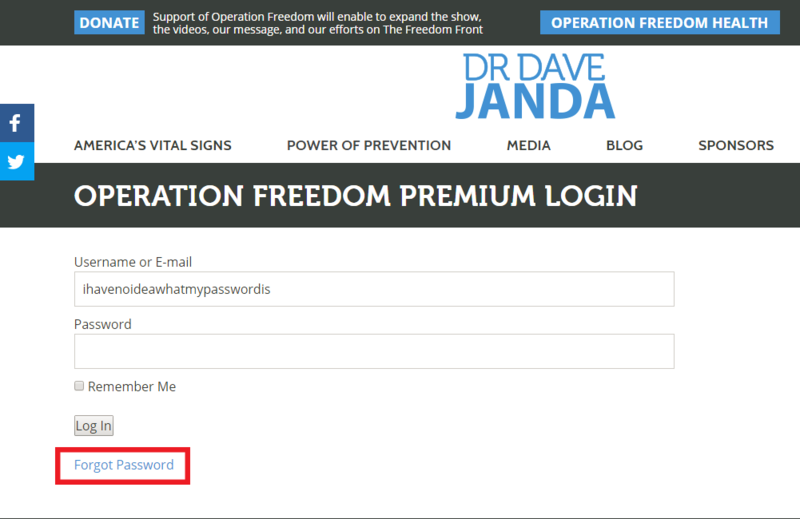 The Operation Freedom tech team has made it as easy as possible to sign up for Operation Freedom Premium Access. By clicking the “subscribe” button located on the home page just under the slider graphics, our listeners are presented with the option to pay either by credit card / debit card using Stripe, or use their PayPal accounting utilizing the PayPal option. After entering the requisite details such as email address and user name, subscribers who have completed the payment process will receive a welcome email from davejanda.com. This email will allow users to set their desired password upon initial login (clicking the link in the email as designated). Option 1: On the login page, below the login options there is a link marked “forgot password”. Clicking this will take the user to a page whereupon the entry of the appropriate email (the one you signed up with) will auto-send a password reset email. Yep, its that easy. Simply reset your password by clicking the link in the email (once again, the one you signed up with) and you are on your way. Option 2: Can’t remember the email you signed up with or the password to your Premium Access account? We still have you covered. Simply email support@davejanda.supportsystem.com. We can have a look for you and reset any relevant premium account information such that you can continue to enjoy your Premium Access benefits. For those that are using any “third party ad / spyware blocker” software, good for being pragmatic about digital security. However, there are rare instances where some content (because of the method in which we load content here) can be “blocked” by various browser add ons. Before emailing us a tech support ticket (which of course we are happy to help with), try turning off the pop up and/or “browser privacy” options. Again, its rare that it happens but it can. On all the full screen media audio player pages, just to the right of the player controls, there is a downward pointing arrow. (see photo). Simply click that and our Premium Access members are able to download guest segments or entire episodes to their local machines/devices. Thats it. No really, its that easy. Now you can take Operation Freedom with you on the go… even if you have no internet connection. 5. Where is the latest episode, it used to be on the home page!? Because of the way that the membership / premium access software works, we did have to re-tool the way site traffic flows. By clicking the latest episode link and entering the show archives, you will find the newest episode at the top left most portion of the episode grid. Each sunday, as the show is uploaded from the studio, a new entry will be created with the most recent episode being on page one, row one, column one of the show archive grid. 6. I just signed up, why can’t I login to Operation Freedom Premium Access? This is an easy one. We remind our subscribers to make sure that the email address they are logging in with is the same as the one that they signed up with. Once again, it happens to the best of us. Operation Freedom access will only recognize the email that was used during the sign up / payment process. Hey, as we said, it happens to the best of us. Fortunately wherever there are problems, the solution tends to be near by. In the instance of Operation Freedom Premium Access, the solution in nearly all cases can be acquired by emailing our dedicated IT / subscriber support team. Simply click the button below and let us help.